You've read it as a biblical tale of courage. Experience it anew as a heart-stirring love story. An inspired re-imagining of the tale of Esther, a young Jewish woman thrust from a life of obscurity into a life of power, wealth, intrigue . . . and tender love. Imagine anew the story of Esther, one of our faith's great heroines, destined to play a key role in the history of Christianity. She was a simple girl faced with an impossible choice. He was a magnificent king with a lonely heart. Their love was the divine surprise that changed the course of history. The beloved story of Esther springs to fresh life in this inspired novel that vibrates with mystery, intrigue, and romance. See the story of Esther in an entirely new way-with all the political intrigue and tension you remember, but told as a passionate and tender love story between a young man and woman. Misunderstood by many, King Xerxes was a powerful but lonely man. Esther's beauty caught the eye of the young king, but it was her spirit that captured his heart. The story of Esther in the Bible is inspirational. In the year 485 BC, Esther is a young Persian woman with Jewish roots. When the King of Persia repudiates his first wife, Vashti, he begins a search for a new wife. Young women from all corners of the kingdom eagerly attend hoping to be the one the king will choose. Although unwilling at first, Esther’s guardians encourage her to vie for his attention so that she might influence him to keep the Jews from destruction. Esther enters the harem, and much to everyone’s surprise, it is she who fascinates the King and ultimately wins his heart. However, she must keep her Jewish roots a secret from her new husband, at great risk to herself. 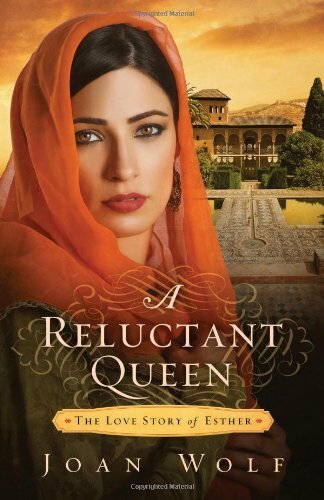 In A Reluctant Queen: The Love Story of Esther, author Joan Wolf gives a fascinating recounting of this intriguing Bible story. She writes in an easy to read, unencumbered style that allows you to fall into the story easily. I enjoyed the story very much. The beautiful cover art drew me to the novel, but it was the story and easy prose that kept me turning pages. The love story between Esther and the King was brilliantly depicted, as was all the intrigue and power struggles. Esther is an endearing character who goes against all Jewish practices to live an opulent life, very different from the simple life she is used to. This is great Christian fiction – tale of destiny and courage, and sweet love. I am curious as to why this is considered "Christian" fiction. Esther's story is the basis for Purim, a Jewish holiday and some consider her to be one of the Jewish matriarchs and even a Jewish heroine. I've not read this book, but I would think this is more "Jewish" fiction than Christian. Where does Christianity come into it? Thank you for pointing that out. It is definitely Jewish. What I should have said is that it is Biblical Fiction. I stand corrected and grateful for your comment. Thanks again.